The future of Fannie Mae and Freddie Mac is in the news with a speech by the President last week outlining his proposed reforms for the pair of housing finance giants. What role should the government play in the housing market in the aftermath of the second collapse of the American housing finance sector in three decades (the first being the S&L crisis)? All theory and evidence indicates that the role should be minimal, and that Fannie and Freddie should be abolished. What do Fannie and Freddie do? First, a quick review of what the GSEs do. Their main role, at least before the crisis, was mortgage pooling and securitization. A bank issues mortgages to a set of homeowners. It then goes to Fannie or Freddie and trades this bundle of mortgages for a security (a mortgage-backed security, MBS) that pays regular, guaranteed dividends corresponding to mortgage payments associated with the underlying loans. In exchange, the GSE takes a cut of the pay, usually around 20 basis points (.2%). The GSE guarantee ensures payment, even in the event of default. The real impact of the GSEs on the housing market comes from the fact that they can only purchase “conforming loans”. Conforming loans must meet a set of criteria. For example, the loan has to be below a certain size ($417,000 for one unit loans in 2008), which historically increased annually with average home prices. Anything above this amount was called a jumbo loan. Other criteria include a maximum loan-to-value ratio and proper documentation. I would claim that the GSEs have three principal impacts on the housing market. First, the GSEs help standardize financial products in mortgage market. Because of the conforming loan standard, lenders are incentivized to produce products and make loans that conform to these standards. This is a good thing: standardizing complicated financial products helps consumers make informed decisions. However, the standard has not made mortgages totally accessible for consumers, since mortgages are still considered confusing. That the CFPB is doing a lot with mortgages is evidence of that. Through its (once implicit, now explicit) federal government-backed participation in the mortgage market, Fannie and Freddie lower the cost of home ownership and thus encourage more home ownership – and less renting – than would otherwise occur. Many economists, even many of those who believe Fannie and Freddie should be abolished, believe this is a noble cause. According to this line of thinking, home ownership has positive externalities. Homeowners take better care of their homes than renters (as a renter… I admit this is probably accurate) and are potentially more actively involved in their communities. The benefits, however, are hard to quantify. This makes them difficult to justify against costs of propping up Fannie and Freddie. What is more quantifiable is the impact on the rate of homeownership in the U.S., and that impact appears to be small. The U.S. does not have the highest homeownership rate in the world, despite having unique government involvement in housing finance. Indeed, we do not even have above average homeownership. The 2007 rate was 68%, which is pretty much smack dab in the middle among developed countries. Thus, even if homeownership is something to be encouraged (which is far from clear), Fannie and Freddie do not do much to encourage it. 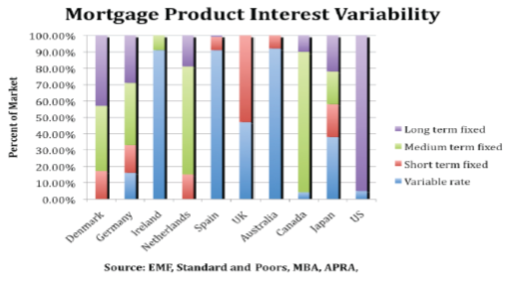 As can be seen in the graph above, the US is unique among peer nations in having a mortgage market that is dominated by long term fixed rate loans (colored purple). This is largely a result of the distortion of the market by the GSEs, though also, importantly, because of strong consumer preferences. Consider: why would a bank want to make a 30 year fixed rate loan? If market interest rates go up, the bank will not receive any benefit. If rates go down, homeowners can refinance. While good for the borrower, this is not attractive for the bank. This is also evident from the historical record. Before the government got involved in the mortgage market during the New Deal, residential mortgages were typically much shorter, 5-10 years, and carried a variable rate of interest. A mortgage could in effect last longer than 5-10 years if the borrower refinanced at the end of the loan, but it meant that the borrower bore the interest risk. However, if the GSEs were abolished, it is highly unlikely the 30 year fixed rate mortgage would disappear. As mentioned earlier, conforming loans have a size limit, above which loans are known as jumbo loans. 30 year fixed rate jumbo loans still exist; they just require a higher interest rate, something like 20 basis points. If you are a homeowner and receiving this subsidy, this might sound like a good enough reason to keep the GSEs around. For America as a whole, however, this does not seem like a positive benefit. Why should this particular type of mortgage be subsidized? Is the social benefit of long term, fixed rate mortgages higher than the private benefit? That would be a tough argument to make. Even homeowners should remember that though the GSEs subsidize their fixed rate mortgages, it is not for free. Bailing out the GSEs, or even paying for their operation in normal times, means paying higher taxes in the long run. Besides perhaps creating some limited standardization of financial products, there does not appear to be anything socially useful that Fannie and Freddie do that the private market could not on its own. Without any justification for their existence, and with the high fiscal cost of maintaining them, the two should be wound down and abolished.